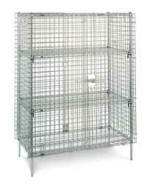 Heavy gauge open wire construction keeps contents visible at all times, making it easy to check inventory. • Optional Adjustable Intermediate Shelves: Patented easily adjustable shelf designs — Super Adjustable Super Erecta, MetroMax Q, and qwikSLOT — allow flexibility to meet changing needs. Can be positioned in 1" (25 mm) increments along the entire height of post. • Patented, Ergonomic, 1/4-Turn Door Handle: Makes opening and closing the unit easier than conventional security unit designs. • Double Door: Each door opens 270 degrees and can be secured along the sides of the unit. 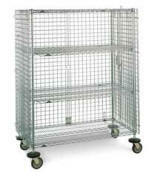 • Mobile Units: Available in Standard and Heavy-Duty models. Heavy-Duty units offer increased rigidity and durability for applications such as crossing thresholds. • Stationary Units: Posts have leveling feet to compensate for uneven surfaces. 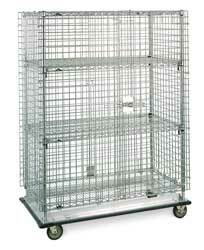 • Time Saving Assembly: Metro security units assemble quickly — right out of the box. • Shipped Knocked-Down: Saves on freight costs. Easily assembled.